One of the types of comics that are underrepresented – at least in the mainstream part of comics – are ones for younger readers. There’s a ton of great stuff out there, don’t get me wrong (I’m very fond of Raina Telgemeier and Kazu Kibuishi’s work, for two), but it’s always good to see new projects aimed at kids. It’s even better when they’re educational. Comics that don’t just entertain kids, but help them better understand the world around them. Howtoons from Nick Dragotta, Saul Griffith, Ingrid Dragotta and Joost Bonsen is one, but that’s about the whole list for me. Until My First Startup from the team at YourComicStory.com, that is. David Kieve and his partners Russell and Andrey put together a Kickstarter campaign built around developing a comic educating kids about entrepreneurship and how they can start their own businesses from scratch. Sounds odd, maybe, but there are more and more stories of kids launching really cool businesses themselves, and anything that helps arm them to better accomplish those goals is okay in my book. 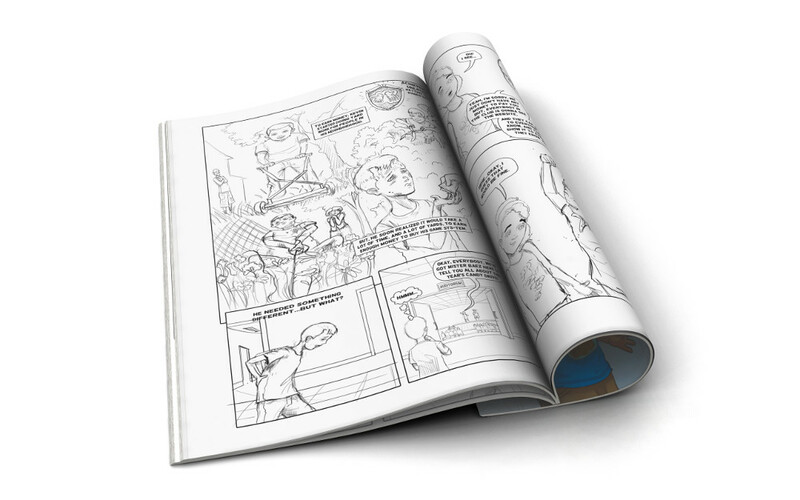 It’s a neat project that the team reached out to me about, and as someone looking to support comics of this type, I spoke with Kieve about where the project came from, what research they put together to better prepare for this book, the Startup Toolkit (featuring Shopify, Instapage and more) that comes as a reward in the Kickstarter, and much more. Know a kid interested in making a business either big or small? This might be a project that’s of interest to you. The breadth of comic genres is wider than ever, but besides Nick Dragotta (and friends!) Howtoons, educational comics aren’t very prevalent. What made you want to develop a comic built around educating and informing kids through comic books? What is it about comics that you think engages kids better than other mediums? DK: This is something we – as serial entrepreneurs – wish we had as kids. Unlike a textbook, My First Startup is fun as a story. That teaches kids important life skills like time management, decision making, responsibility for own success, and more is a huge benefit – but we made sure business learning is an interesting part of the story. The magic of comic books is that a kid can pick one up and read on his/her own. it’s visual style, panels, and action really help a kid feel like a superhero. 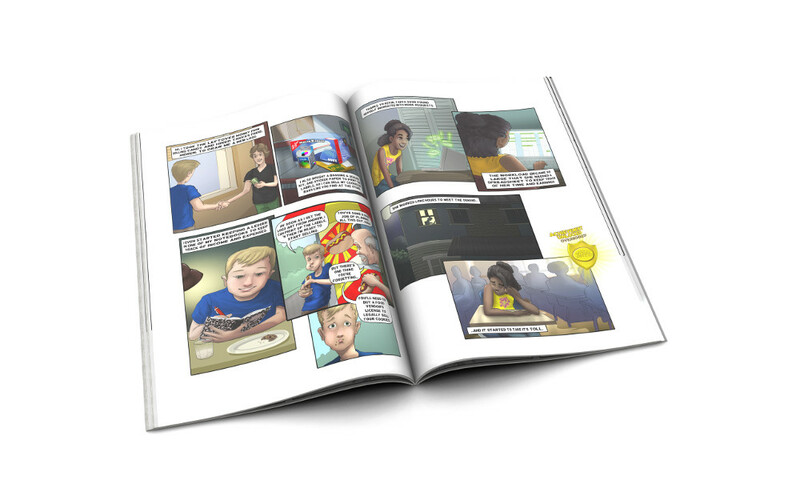 It doesn’t hurt that our startup, YourComicStory.com, creates custom comic books – we had the solution right in front of us, so just made the natural leap into educating kids about entrepreneurship in a way they love. Entrepreneurship as a topic may seem out of nowhere, but as you pointed out in the Kickstarter, there are really famous (and cool!) examples of young people making businesses work and work well. What is it about that subject that you think intrigues kids, and how do you use the comic form to educate them on the subject? DK: Entrepreneurship is exciting – with the obstacles/solutions mechanics reminiscent of any kid’s game (including video games, of course). The kids we tested quickly grasped the issues, emphasized with the protagonists, and tried to come up with solutions. Entrepreneurship is creativity and gameplay – and the best part is that kids can take their dreams and make them into reality. Instead of having adults telling them that something’s impossible, entrepreneur kids make it possible (and have a nice “told you I could do it” moment that builds confidence. Given that it’s educational, you want this story to be as reflective of the real entrepreneurial path as possible. You’re serial entrepreneurs, but I’m curious, what research did you do to make sure that this wasn’t just a light but entertaining comic about starting your own business, but something helpful overall? DK: You’re exactly on point! When creating My First Startup, we consulted with economists, child psychologists, and entrepreneurs who’ve been in business for decades. This way we made sure that it’s sound business advice with realistic situations, and that it’s structured in the best way for kids to learn. One of the coolest parts about the Kickstarter in my book is the Startup Toolkit. A lot of people have big ideas but actually implementing them is another thing entirely. That toolkit helps. How did that idea come together, both as something you wanted to include and in terms of recruiting partners for it? DK: Pretty early on, we decided that we want to give kids both theory and practice. We’re not trying to promote the idea of “wouldn’t it be nice to create a startup?” but rather want to inspire kids to actually create one. Recruiting partners for it was another matter altogether. We reached out to the ones we consider most relevant: eCommerce, business cards, landing pages, shipping, email marketing. Combine these – and you can really give your startup a head start. I admit, at first we were nervous if any of the potential partners will even respond. Yet they did, and we even had to reject a few partners to avoid duplicates. Ultimately, we’re grateful to every partner for making the Startup Toolkit an incredibly valuable reward for the backers and boost for the kids’ business. Naturally, any creative endeavor needs funding to get started. How did your team decide to go the route of Kickstarting this project? DK: Beyond the usual need to fund the project, we wanted to stay true to the entrepreneurial nature of My First Startup. So we’re putting it in front of the people and letting them vote with their money, letting them tell us if teaching kids entrepreneurship is important. One aspect I didn’t see in there that I think could be of value is some rewards level for libraries. Granted, I’m a total Kickstarter neophyte, but have you done any outreach for getting this in front of librarians? Libraries stand out as an excellent fit to me. DK: We did add a “Super School” reward for schools and other organizations, where they can order a bundle of copies of our comic book. I think a library will find this reward useful as well. The Kickstarter’s going to cover books for a lot of happy kids, but are there any plans to produce more copies beyond the Kickstarter? Or is this a one and done print run? DK: We’re currently discussing our post-Kickstarter plans, so nothing is finalized as of yet. As you’ll notice, one of the Kickstarter rewards is for schools and educational organizations – which is a good way to get the My First Startup in the hands of thousands of kids. I really love the educational element of this book, but there are a lot of other directions you could go with comics and topics for kids. If this Kickstarter is a success, does your team have any plans to cover any topics? Or was this a special case due to your own interest in entrepreneurship? DK: This is also something we’re considering, but currently at the discussion stage. It’s certainly an interesting path and there are plenty of important topics that comic books would be ideal to cover.